Delivering the keynote address at the 8th Defence Seminar organised by the Sri Lanka Army at the BMICH yesterday, the Prime Minister said though the nature of warfare remains as in ancient times, a clash of interests among organised groups or state, however the science of warfare has drastically changed. “Chairman Mao once said that political power grows out of a barrel of a gun. But 60 years later conflicts are no longer limited to conventional weapons and battles. Therefore, conflict management and resolution demands a more comprehensive and integrated approach than ever before. Today’s battlefield is not only expanding as noted by US Army General Mark Odum, it is converging and compressing, creating a situation where the fast moving global trends across all elements of national powers are transforming the nature of present society and impacting on human life, including the character and nature of warfare,” the Prime Minister noted. Prime Minister Wickremesinghe, elaborating on the broader prospective of security threats said, these trends are attributed to rapid advancements in science and technology, where innovations and inventions are made possible at a lightening pace and increased human interactions facilitated through the internet and social media, making cognisance, perceptions and opinions instantly available to influence the masses across the world. He said multinational cooperation in all forms of affairs, particularly related to the issues of national and international affairs therefore, is essential due to the complex nature of threats developing against humanity and mankind. “In such a complex world the effectiveness of militaries is more realistic to visualise in collaborative and cooperative landscape than a competitive arena. In this context military professionalism should grow with the transformation of operational environment retaining the ability to engage in a broader spectrum of security while keeping a step ahead of adversaries at all times,” the Prime Minister said. Seminars such as the Defence Seminar, when men in the profession of arms and those in the business of statecraft congregate to focus their intellect in bringing about practical solutions to security issues of this age proves that security as always is paramount to all nation states and cannot come second to any other need, the Prime Minister noted. “Hence, these new issues must be recognised as national security threats and a number of civilian institutions would be required to work with the defence establishments. New mechanisms both civil and military needs to be created finding the threat perception is such that global security needs a global response. Global security challenges emanate from ongoing conflicts and threats which may be man induced or due to natural disaster,.” the Prime Minister said. “We as states need to be prepared for both. States need to cooperate by sharing intelligence, training and knowledge where relevant. Good rapport and a working relationship among security stakeholders locally and internationally are the key to success in meeting future security challenges. It is my belief that the deliberations at this seminar would bring about positive solutions and an understanding of the present day security issues,”the Premier added. 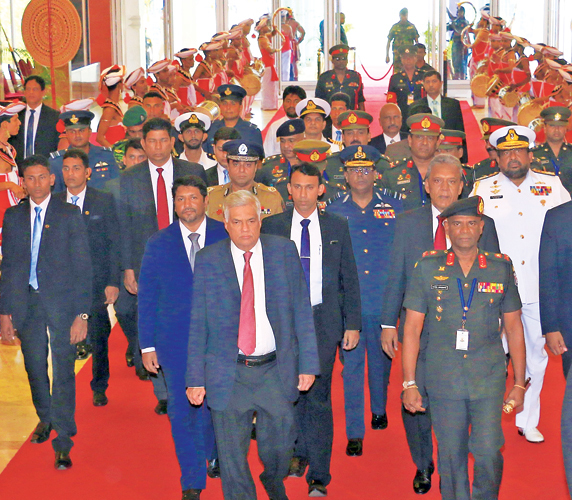 “I am certain, together we would foster greater cooperation and friendship helping us to serve as one for a secure and peaceful future,” Prime Minister Wickremesinghe said in conclusion.